Spock, portrayed by Leonard Nimoy in the original "Star Trek" series and films, was half human and half Vulcan. An evolutionary biologist suggests that such interbreeding could happen only if humans were related to Vulcans by a recent ancestor. Human life, seeded to other planets by an extraterrestrial civilization, could explain why so many of the aliens in the fictional "Star Trek" universe resemble human men and women. After studying scenes from the various shows and movies, one evolutionary biologist posited that the galaxy-wide distribution of Earth-based life-forms could help to explain some of the resemblance between Kirk and Spock. Life on Earth might not have originated on the planet itself. Scientists have long considered the possibility of panspermia, the idea that our planet's life or its precursors came from outer space. After drifting, unplanned, into the habitable environment, the seed material might have developed into life as we know it today. A similar idea was investigated in an episode of "Star Trek: The Next Generation." In "The Chase" (Season 6, Episode 20), an ancient alien species called the Preservers was revealed to have seeded many planets with the same genetic material. Over billions of years, similar plants, animals and humanoids developed on a variety of worlds, according to the story presented in the episode. But Noor doesn't buy it. "Sounds good, but no way," Noor said. Even with the same initial conditions, he said, the probability of plants and animals with similar appearances — and, in species like Vulcans, able to breed with humans — developing on multiple worlds from only genetic material is incredibly low. With the passage of so much time, the various worlds would evolve creatures very different from one another. Instead, Noor proposed that the seeding occurred much more recently than portrayed in the episode. If the human ancestor Homo erectus, along with plants and other animals, were taken by the Preservers only a million years ago, rather than the proposed billion, and were seeded onto planets like Vulcan, the resulting life-forms could be more closely related, Noor said. "It would require an extreme version of fast terraforming, but from a biological perspective, it's at least possible," Noor said. Meanwhile, the Homo erectus individuals who remained on Earth could have evolved into humans while those on Vulcan evolved to become pointy-eared aliens. "The two modern species would surely look similar, but it's likely there would be some physical differences," Noor said, pointing to Vulcans' unusual ears and eyebrows. 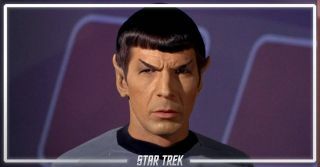 The close genetic relationship among the different descendants of Homo erectus could even allow them to produce an offspring born of both, such as the half-human, half-Vulcan Spock. As a longtime "Star Trek" fan, Noor has enjoyed examining the accuracy of the show. In college, he and his professors would joke about the unfeasible scientific explanations presented in "The Next Generation," the series on the air at the time. To prepare for his Dragon Con presentation, Noor spent time reviewing various episodes from multiple series of the show, and then discussing the science with biologists and chemists. "I think the idea of trying to imagine what life in outer space could be is fascinating," he said. "I have really enjoyed researching this." If human life in the "Star Trek" universe was indeed seeded on multiple planets, Earth would be the most likely original source, Noor said. That's because life-forms on Earth are clearly related to one another in a hierarchal way. Humans would be more closely related to aliens such as Romulans and Klingons than they are to chimpanzees. Confirming this would be "remarkably easy" for an evolutionary biologist in the "Star Trek" universe, Noor said. By comparing DNA samples from other human-like aliens to those of Earthlings, biologists would be able to discover the close genetic relationship between them, which would easily rule out the idea of random, undirected panspermia. "We may even be able to infer approximately how many years ago this happened from the difference in the DNA sequence," Noor said.